(Introduction) Though laparoscopic distal pancreatectomy for benign conditions was first described in the early 1990s, there is limited information on the outcomes of the laparoscopic surgery compared with open surgery. Therefore, this study aimed to investigate the clinical outcomes and to evaluate efficacy of laparoscopic distal pancreatectomy compared with open distal pancreatectomy in the benign or borderline malignant tumors. (Methods) From June 2001 to December 2008, 17 patients underwent laparoscopic distal pancreatectomy, and 26 patients underwent open distal pancreatectomy at our institute. Among 17 patients who underwent laparoscopic distal pancreatectomy, 5 cases (malignancy cases = 2, enucleation cases = 3) were excluded. Among 26 patients who underwent open distal pacreatectomy, 13 cases (trauma cases = 6, malignancy cases = 7) were excluded. 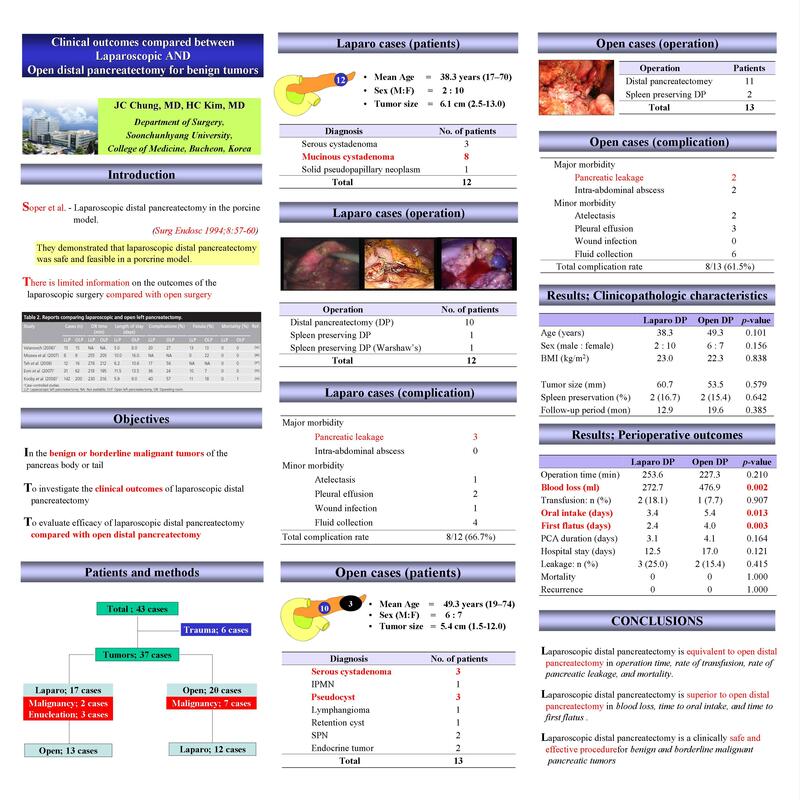 (Results) Laparoscopic distal pancreatectomy is equivalent to open distal pancreatectomy in operation time, rate of transfusion, rate of pancreatic leakage, and mortality. But, laparoscopic distal pancreatectomy is superior to open distal pancreatectomy in blood loss (p=0.002), time to oral intake (p=0.013), and time to first flatus (p=0.003).